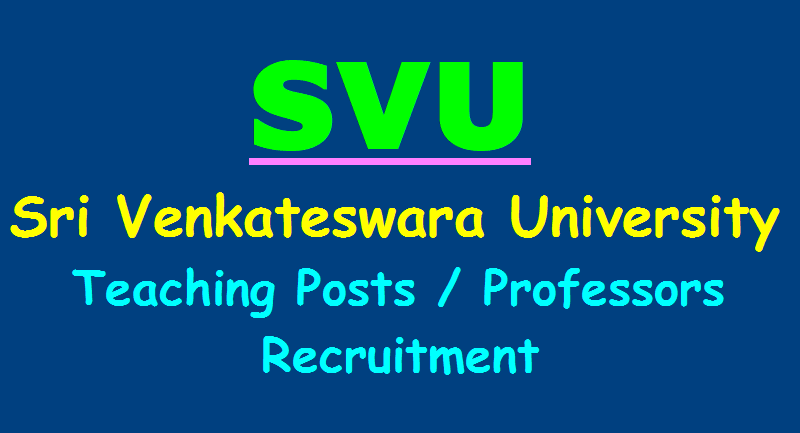 SVU Recruitment, Sri Venkateswara University Teaching Posts /Professors Recruitment 2018, SVU Professors recruitment, SVU Teaching Posts Recruitment 2018, Sri Venkateswara University Teaching Posts Recruitment 2018: Sri Venkateswara University, Tirupati for the post of Associate Professors in the following departments of SVU Colleges, Librarian, SVU Library and Director, Academic Staff College(HRD Centre), SV University, Tirupati. Those who have applied the earlier notification issued during 2013, are also again need to apply afresh “On line Application” presently notified reservation category and the qualification prescribed for the posts. Qualification: Masters Degree, M.Phil./ Ph.D.(Relevant discipline)/ NET/ SET/ SLET with experience. 2. Separate application shall be submitted for each post along with registration fee prescribed as per the Notification / Prospectus. Registration fee once paid will not be refunded. 3. If the space provided in any column of the application is not sufficient for furnish full details relating to that column, a separate sheet may be attached mentioning the head of the column at the top of sheet. 4. Attested True copies of all the testimonials, details of educational qualifications, Date of Birth Certificate, Caste Certificate, Experience Certificate, Service Certificate etc, shall be enclosed to the application. All the Original certificates shall be compulsorily produced at the time of interview for verification. 5. Indian Postal Orders/Bank Challan and Money orders will not be accepted. The University not responsible for any postal delay and lost while in transit. 6. Candidates belonging to SC / ST / BC categories shall enclose attested true copies of Integrated Permanent Caste Certificate issued by the M.R.O. / Tahsildar in the prescribed proforma. Candidates from other categories should enclose certificates issued by the competent authorities, failing which their claims will not be considered. 7. (a) Applicants who are employed shall send their applications through proper channel accompanied by a letter of consent obtained from the employer concerned. (b) Teachers in the employment of the Universities etc., shall apply through proper channel. (c) If the applicant is selected for the post, he / she will be appointed to the post on the minimum pay of the time scale attached to the post and no protection of last pay drawn in the previous employment will be given unless the Selection Committee which selects him / her specifically recommends such protection and the appointing authority accepts it. 8. Experience and qualifications will be reckoned as on the last date prescribed for the submission of filled in application to the University. Good and clear photocopies of all certificates must be attached to the application. 9. Canvassing in any form will be construed as a disqualification. 10. Applications received after the due date and incomplete or not conforming of the prescribed format in any respect will not be considered and no communication will be entertained in this regard. Any postal delay will not be considered. 12. A candidate who is found to have furnished false particulars or to have suppressed material information or to have been found involved in unlawful activities shall be disqualified and if appointed, will be liable to be dismissed without any notice. 13. If any candidate was found convicted by a Court of Law involving illegal activities at a later date and such appointment shall be cancelled automatically without any notice. 15. The University reserves to itself the right to increase or decrease the number of posts to fill or not to fill any or all the notified posts. “Application for the Post of ............in the Department of . 17. There is no provision for the sales of application at the University are elsewhere. Application has to be downloaded from the University website: www.svuniversity.edu.in. 18. Ss per G.O.Ms.No.38 Higher Education (UE) Dept. dated 23.06.2016 – Revision of Appendix to G.O.Ms.No.14 Higher Education (UE.II) Department, dated 20.02.2010 implementation of UGC Regulations 2010, the scale of pay of Professor is Rs. 37400-67000+AGP of Rs.10000. 2. Latest Caste Certificate issued by the Tahsildar / MRO. 6. Attested copy of the Ph.D. certificate issued by the degree-awarding University to the effect that the Ph.D. degree awarded to the candidate is in accordance with the minimum standards and procedures as per UGC Regulations, 2009. 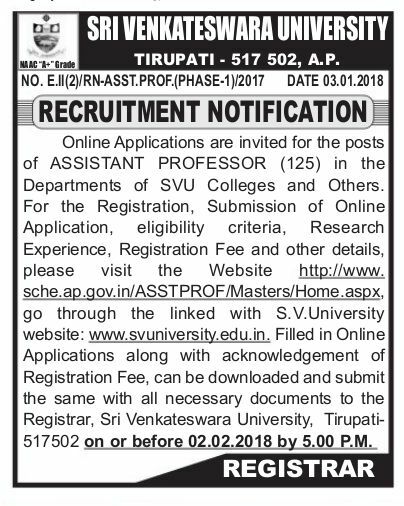 How to Apply: Filled in applications in all respects should be sent to the Registrar, Sri Venkateswara University, Tirupati, Chittoor District (A.P.) India by Registered Post/ Speed Post so as to reach the University office on or before 22.01.2018 together with a Crossed Demand Draft in favor of The Registrar, S.V. University, Tirupati.